For the two-part documentary film, see Yitzhak Rabin: a Biography. Yitzhak Rabin (/rəˈbiːn/; Hebrew: יצחק רבין, IPA: [jitsˈχak ʁaˈbin] ( listen); 1 March 1922 – 4 November 1995) was an Israeli politician, statesman and general. He was the fifth Prime Minister of Israel, serving two terms in office, 1974–77 and 1992 until his assassination in 1995. Rabin was born in Jerusalem to Ukrainian-Jewish immigrants and was raised in a Labor Zionist household. He learned agriculture in school and excelled as a student. He led a 27-year career as a soldier. As a teenager he joined the Palmach, the commando force of the Yishuv. He eventually rose through its ranks to become its chief of operations during Israel's War of Independence. He joined the newly formed Israel Defense Forces in late 1948 and continued to rise as a promising officer. He helped shape the training doctrine of the IDF in the early 1950s, and led the IDF's Operations Directorate from 1959 to 1963. He was appointed Chief of the General Staff in 1964 and oversaw Israel's victory in the 1967 Six-Day War. Rabin served as Israel's ambassador to the United States from 1968 to 1973, during a period of deepening U.S.–Israel ties. He was appointed Prime Minister of Israel in 1974, after the resignation of Golda Meir. In his first term, Rabin signed the Sinai Interim Agreement and ordered the Entebbe raid. He resigned in 1977 in the wake of a financial scandal. Rabin was Israel's minister of defense for much of the 1980s, including during the outbreak of the First Intifada. In 1992, Rabin was re-elected as prime minister on a platform embracing the Israeli–Palestinian peace process. He signed several historic agreements with the Palestinian leadership as part of the Oslo Accords. In 1994, Rabin won the Nobel Peace Prize together with long-time political rival Shimon Peres and Palestinian leader Yasser Arafat. 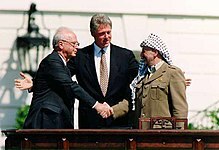 Rabin also signed a peace treaty with Jordan in 1994. In November 1995, he was assassinated by an extremist named Yigal Amir, who opposed the terms of the Oslo Accords. 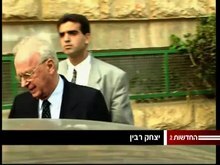 Amir was arrested and convicted of Rabin's murder; he was sentenced to life imprisonment. Rabin was the first native-born prime minister of Israel, the only prime minister to be assassinated and the second to die in office after Levi Eshkol. Rabin has become a symbol of the Israeli–Palestinian peace process. Rabin was born at Shaare Zedek Medical Center in Jerusalem on 1 March 1922, Mandatory Palestine, to Nehemiah (1886 – 1 December 1971) and Rosa (née Cohen; 1890 – 12 November 1937) Rabin, immigrants of the Third Aliyah, the third wave of Jewish immigration to Palestine from Europe. Nehemiah was born Nehemiah Rubitzov in the shtetl Sydorovychi near Ivankiv in the southern Pale of Settlement (present-day Ukraine). His father Menachem died when he was a boy, and Nehemiah worked to support his family from an early age. At the age of 18, he emigrated to the United States, where he joined the Poale Zion party and changed his surname to Rabin. In 1917, Nehemiah Rabin went to Mandatory Palestine with a group of volunteers from the Jewish Legion. Yitzhak's mother, Rosa Cohen, was born in 1890 in Mogilev in Belarus. Her father, a rabbi, opposed the Zionist movement and sent Rosa to a Christian high school for girls in Gomel, which gave her a broad general education. Early on, Rosa took an interest in political and social causes. In 1919, she traveled to Palestine on the steamship Ruslan. After working on a kibbutz on the shores of the Sea of Galilee, she moved to Jerusalem. Rabin's parents met in Jerusalem during the 1920 Nebi Musa riots. They moved to Tel Aviv's Chlenov Street near Jaffa in 1923. Nehemiah became a worker for the Palestine Electric Corporation and Rosa was an accountant and local activist. She became a member of the Tel Aviv City Council. The family moved again in 1931 to a two-room apartment on Hamagid Street in Tel Aviv. Rabin grew up in Tel Aviv, where the family relocated when he was one year old. He enrolled in the Tel Aviv Beit Hinuch Leyaldei Ovdim (בית חינוך לילדי עובדים, "School House for Workers' Children") in 1928 and completed his studies there in 1935. The school taught the children agriculture as well as Zionism. Rabin mostly received good marks in school, but he was so shy that few people knew he was intelligent. In 1935, Rabin enrolled at an agricultural school on kibbutz Givat Hashlosha that his mother founded. It was here in 1936 at the age of 14 that Rabin joined the Haganah and received his first military training, learning how to use a pistol and stand guard. He joined a socialist-Zionist youth movement, HaNoar HaOved. In 1937, he enrolled at the two-year Kadoorie Agricultural High School. He excelled in a number of agriculture-related subjects but disliked studying English language—the language of the British "enemy." He originally aspired to be an irrigation engineer, but his interest in military affairs intensified in 1938, when the ongoing Arab revolt worsened. A young Haganah sergeant named Yigal Allon, later a general in the IDF and prominent politician, trained Rabin and others at Kadoorie. Rabin finished at Kadoorie in August 1940. For part of 1939, the British closed Kadoorie, and Rabin joined Allon as a military policeman at Kibbutz Ginosar until the school re-opened. When he finished school, Rabin considered studying irrigation engineering on scholarship at the University of California, Berkeley, although he ultimately decided to stay and fight in Palestine. Rabin married Leah Schlossberg during the 1948 Arab–Israeli War. Leah Rabin was working at the time as a reporter for a Palmach newspaper. They had two children, Dalia (born 19 March 1950) and Yuval (born 18 June 1955). Rabin was non-religious; according to American diplomat Dennis Ross, Rabin was the most secular Jew he had met in Israel. In 1941, during his practical training at kibbutz Ramat Yohanan, Rabin joined the newly formed Palmach section of the Haganah, under the influence of Yigal Allon. Rabin could not yet operate a machine gun, drive a car, or ride a motorcycle, but Moshe Dayan accepted the new recruit. The first operation he participated in was assisting the allied invasion of Lebanon, then held by Vichy French forces (the same operation in which Dayan lost his eye) in June–July 1941. Allon continued to train the young Palmach forces. As a Palmachnik, Rabin and his men had to lie low to avoid arousing inquiry from the British administration. They spent most of their time farming, training secretly part-time. They wore no uniforms and received no public recognition during this time. In 1943, Rabin took command of a platoon at Kfar Giladi. He trained his men in modern tactics and how to conduct lightning attacks. After the end of the war the relationship between the Palmach and the British authorities became strained, especially with respect to the treatment of Jewish immigration. In October 1945 Rabin was in charge of planning and later executing an operation for the release of interned immigrants from the Atlit detainee camp for Jewish illegal immigrants. In the Black Shabbat, a massive British operation against the leaders of the Jewish Establishment in the British Mandate of Palestine, Rabin was arrested and detained for five months. After his release he became the commander of the second Palmach battalion and rose to the position of Chief Operations Officer of the Palmach in October 1947. During the 1948 Arab–Israeli War Rabin directed Israeli operations in Jerusalem and fought the Egyptian army in the Negev. During the beginning of the war he was the commander of the Harel Brigade, which fought on the road to Jerusalem from the coastal plain, including the Israeli "Burma Road," as well as many battles in Jerusalem, such as securing the southern side of the city by recapturing kibbutz Ramat Rachel. During the first truce he led the Ben Gurion ordered attack by the IDF against the Irgun on the beach of Tel Aviv as part of the Altalena Affair. "... 1. The inhabitants of Lydda must be expelled quickly without attention to age. ... 2. Implement immediately." Later, Rabin was chief of operations for the Southern Front and participated in the major battles ending the fighting there, including Operation Yoav and Operation Horev. In the beginning of 1949 he was a member of the Israeli delegation to the armistice talks with Egypt that were held on the island of Rhodes. The result of the negotiations were the 1949 Armistice Agreements, which ended the official hostilities of the 1948 Arab–Israeli War. Following the demobilization at the end of the war he was the most senior (former) member of the Palmach that remained in the IDF. Like many Palmach leaders, Rabin was politically aligned with the left wing pro-Soviet Ahdut HaAvoda party and later Mapam. These officers were distrusted by Prime Minister David Ben Gurion and several resigned from the army in 1953 after a series of confrontations. Those members of Mapam who remained, such as Rabin, Haim Bar-Lev and David Elazar, had to endure several years in staff or training posts before resuming their careers. Rabin headed Israel's Northern Command from 1956 to 1959. In 1964 he was appointed chief of staff of the Israel Defense Forces (IDF) by Levi Eshkol, who had replaced David Ben-Gurion as Prime-Minister and Minister of Defence. Since Eshkol did not have much military experience and trusted Rabin's judgement, he had a very free hand. According to the memoirs of Eshkol's military secretary, Eshkol followed Rabin "with closed eyes". Under his command, the IDF achieved victory over Egypt, Syria and Jordan in the Six-Day War in 1967. After the Old City of Jerusalem was captured by the IDF, Rabin was among the first to visit the Old City, and delivered a famous speech on Mount Scopus, at the Hebrew University. In the days leading up to the war, it was reported that Rabin suffered a nervous breakdown and was unable to function. After this short hiatus, he resumed full command over the IDF. Following his retirement from the IDF he became ambassador to the United States beginning in 1968, serving for five years. In this period the US became the major weapon supplier of Israel and in particular he managed to get the embargo on the F-4 Phantom fighter jets lifted. During the 1973 Yom Kippur War he served in no official capacity and in the elections held at the end of 1973 he was elected to the Knesset as a member of the Alignment. He was appointed Israeli Minister of Labour in March 1974 in Golda Meir's short-lived government. While serving as ambassador, Rabin met and formed a relationship with Menachem M. Schneerson. Following Golda Meir's resignation in April 1974, Rabin was elected party leader, after he defeated Shimon Peres. The rivalry between these two Labour leaders remained fierce and they competed several times in the next two decades for the leadership role, and even for who deserved credit for government achievements. Rabin succeeded Golda Meir as Prime Minister of Israel on 3 June 1974. This was a coalition government, including Ratz, the Independent Liberals, Progress and Development and the Arab List for Bedouins and Villagers. This arrangement, with a bare parliamentary majority, held for a few months and was one of the few periods in Israel's history where the religious parties were not part of the coalition. The National Religious Party joined the coalition on 30 October 1974 and Ratz left on 6 November. In foreign policy, the major development at the beginning of Rabin's term was the Sinai Interim Agreement between Israel and Egypt, signed on 1 September 1975. Both countries declared that the conflict between them and in the Middle East shall not be resolved by military force but by peaceful means. This agreement followed Henry Kissinger's shuttle diplomacy and a threatened "reassessment" of the United States' regional policy and its relations with Israel. Rabin notes it was "an innocent-sounding term that heralded one of the worst periods in American–Israeli relations." But the agreement was an important step towards the Camp David Accords of 1978 and the peace treaty with Egypt signed in 1979. Operation Entebbe was perhaps the most dramatic event during Rabin's first term of office. On his orders, the IDF performed a long-range undercover raid to rescue passengers of an airliner hijacked by militants belonging to the Popular Front for the Liberation of Palestine's Wadie Haddad faction and the German Revolutionary Cells (RZ), who had been brought to Idi Amin's Uganda. The operation was generally considered a tremendous success, and its spectacular character has made it the subject of much continued comment and study. Towards the end of 1976 his coalition government with the religious parties suffered a crisis: A motion of no confidence had been brought by Agudat Yisrael over a breach of the Sabbath on an Israeli Air Force base when four F-15 jets were delivered from the US and the National Religious Party had abstained. Rabin dissolved his government and decided on new elections, which were to be held in May 1977. Following the March 1977 meeting between Rabin and U.S. President Jimmy Carter, Rabin publicly announced that the U.S. supported the Israeli idea of defensible borders; Carter then issued a clarification. A "fallout" in U.S./Israeli relations ensued. It is thought that the fallout contributed to the Israeli Labor Party's defeat in the May 1977 elections. On 15 March 1977, Haaretz journalist Dan Margalit revealed that a joint dollar account in the names of Yitzhak and Leah Rabin, opened in a Washington, D.C., bank during Rabin's term of office as Israel ambassador (1968–73), was still open, in breach of Israeli law. According to Israeli currency regulations at the time, it was illegal for citizens to maintain foreign bank accounts without prior authorization. Rabin resigned on 8 April 1977, following the revelation by Maariv journalist S. Isaac Mekel that the Rabins held two accounts in Washington, not one, containing $10,000, and that a Finance Ministry administrative penalty committee fined them IL150,000. Rabin withdrew from the party leadership and candidacy for prime minister. Following his resignation and Labour Party defeat at the elections, Likud's Menachem Begin was elected in 1977. Until 1984 Rabin had been a member of Knesset and had sat on the Foreign Affairs and Defense Committee. From 1984 to 1990, he served as Minister of Defense in several national unity governments led by prime ministers Yitzhak Shamir and Shimon Peres. When Rabin came to office, Israeli troops were still deep in Lebanon. Rabin ordered their withdrawal to a "Security Zone" on the Lebanese side of the border. The South Lebanon Army was active in this zone, along with the Israeli Defence Forces. When the first Intifada broke out, Rabin adopted harsh measures to stop the demonstrations, even authorizing the use of "Force, might and beatings," on the demonstrators. Rabin the "bone breaker" was used as an International image. The combination of the failure of the "Iron Fist" policy, Israel's deteriorating international image, and Jordan cutting legal and administrative ties to the West Bank with the U.S.'s recognition of the PLO as the representative of the Palestinian people forced Rabin to seek an end to the violence through negotiation and dialogue with the PLO. From 1990 to 1992, Rabin again served as a Knesset member and sat on the Foreign Affairs and Defense Committee. In 1992 Rabin was elected as chairman of the Labor Party, winning against Shimon Peres. In the elections that year his party, strongly focusing on the popularity of its leader, managed to win a clear victory over the Likud of incumbent Prime Minister Yitzhak Shamir. However, the left-wing bloc in the Knesset only won an overall narrow majority, facilitated by the disqualification of small nationalist parties that did not manage to pass the electoral threshold. Rabin formed the first Labor-led government in fifteen years, supported by a coalition with Meretz, a left wing party, and Shas, a Mizrahi ultra-orthodox religious party. On 25 July 1993, after Hezbollah fired rockets into northern Israel, Rabin authorized a week-long military operation in Lebanon. Rabin played a leading role in the signing of the Oslo Accords, which created the Palestinian National Authority and granted it partial control over parts of the Gaza Strip and West Bank. Prior to the signing of the accords, Rabin received a letter from PLO chairman Yasser Arafat renouncing violence and officially recognizing Israel, and on the same day, 9 September 1993, Rabin sent Arafat a letter officially recognizing the PLO. After the announcement of the Oslo Accords there were many protest demonstrations in Israel objecting to the Accords. As these protests dragged on, Rabin insisted that as long as he had a majority in the Knesset he would ignore the protests and the protesters. In this context he said, "they (the protesters) can spin around and around like propellers" but he would continue on the path of the Oslo Accords. Rabin's parliamentary majority rested on non-coalition member Arab support. Rabin also denied the right of American Jews to object to his plan for peace, calling any such dissent "chutzpah." The Oslo agreement was also opposed by Hamas and other Palestinian factions, which launched suicide bombings at Israel. After the historical handshake with Yasser Arafat, Rabin said, on behalf of the Israeli people, "We who have fought against you, the Palestinians, we say to you today, in a loud and a clear voice, enough of blood and tears ... enough!" During this term of office, Rabin also oversaw the signing of the Israel–Jordan peace treaty in 1994. Rabin significantly reformed Israel's economy, as well as its education and healthcare systems. His government significantly expanded the privatization of business, moving away from the country's traditionally socialized economy. The scheme was described by Moshe Arens as a "privatization frenzy." In 1993, his government set up the "Yozma" program, under which attractive tax incentives were offered to foreign venture capital funds that invested in Israel and promised to double any investment with government funding. As a result, foreign venture capital funds invested heavily in the growing Israeli high-tech industry, contributing to Israel's economic growth and status as a world leader in high-tech. In 1995, the National Health Insurance Law was passed. The law created Israel's universal health care system, moving away from the traditionally Histadrut-dominated health insurance system. Doctors' wages were also raised by 50%. Education spending was raised by 70%, with new colleges being built in Israel's peripheral areas, and teachers' wages rising by one-fifth. His government also launched new public works projects such as the Cross-Israel Highway and an expansion of Ben Gurion Airport. For his role in the creation of the Oslo Accords, Rabin was awarded the 1994 Nobel Peace Prize, along with Yasser Arafat and Shimon Peres. The Accords greatly divided Israeli society, with some seeing Rabin as a hero for advancing the cause of peace and some seeing him as a traitor for giving away land they viewed as rightfully belonging to Israel. Many Israelis on the right wing often blame him for Jewish deaths in terror attacks, attributing them to the Oslo agreements. On the evening of 4 November 1995 (12th of Heshvan on the Hebrew Calendar), Rabin was assassinated by Yigal Amir, a right-wing extremist who opposed the signing of the Oslo Accords. Rabin had been attending a mass rally at the Kings of Israel Square (now Rabin Square) in Tel Aviv, held in support of the Oslo Accords. When the rally ended, Rabin walked down the city hall steps towards the open door of his car, at which point Amir fired three shots at Rabin with a semi-automatic pistol. Two shots hit Rabin, and the third lightly injured Yoram Rubin, one of Rabin's bodyguards. Rabin was taken to the nearby Ichilov Hospital with considerable delay, where he died on the operating table less than 40 minutes later due to blood loss and a punctured lung. Amir was immediately seized by Rabin's bodyguards. He was later tried, found guilty, and sentenced to life imprisonment. After an emergency cabinet meeting, Israel's foreign minister, Shimon Peres, was appointed as acting Israeli prime minister. Rabin's assassination came as a great shock to the Israeli public and much of the rest of the world. Hundreds of thousands of Israelis thronged the square where Rabin was assassinated to mourn his death. Young people, in particular, turned out in large numbers, lighting memorial candles and singing peace songs. On 6 November 1995, he was buried on Mount Herzl. Rabin's funeral was attended by many world leaders, among them U.S. president Bill Clinton, Australian Prime Minister Paul Keating, Egyptian president Hosni Mubarak and King Hussein of Jordan. Clinton delivered a eulogy whose final words were in Hebrew – "Shalom, Haver" (Hebrew: שלום חבר‎, lit. Goodbye, Friend). 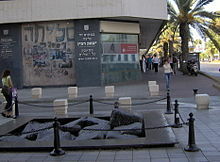 The square where he was assassinated, Kikar Malkhei Yisrael (Kings of Israel Square), was renamed Rabin Square in his honor. Many other streets and public institutions in Israel have also subsequently been named after him. After his assassination, Rabin was hailed as a national symbol and came to embody the ethos of the "Israeli peace camp," despite his military career and hawkish views earlier in life. In November 2000, his wife Leah died and was buried alongside him. After the murder, it was revealed that Avishai Raviv, a well known right-wing extremist at the time, was in fact a Shin Bet agent-informer code-named Champagne. Raviv was later acquitted in court of charges that he failed to prevent the assassination. The court ruled there was no evidence that Raviv knew assassin Yigal Amir was plotting to kill Rabin. After Rabin's assassination, his daughter Dalia Rabin-Pelossof entered politics and was elected to the Knesset in 1999 as part of the Center Party. In 2001, she served as Israel's deputy minister of defense. The Knesset has set the 12th of Cheshvan, the murder date according to the Hebrew calendar, as the official memorial day of Rabin. In 1995 the Israeli Postal Authority issued a commemorative Rabin stamp. In 1996 Israeli songwriter Naomi Shemer translated Walt Whitman's poem "O Captain! My Captain!" to Hebrew and wrote music for it to mark the anniversary of Rabin's assassination. The song is since commonly performed or played in Yitzhak Rabin memorial day services. The Yitzhak Rabin Centre was founded in 1997 by an act of the Knesset, to create "[a] Memorial Centre for Perpetuating the Memory of Yitzhak Rabin." It carries out extensive commemorative and educational activities emphasising the ways and means of democracy and peace. Mechinat Rabin, an Israeli pre-army preparatory program for training recent high school graduates in leadership prior to their IDF service, was established in 1998. In 2005 Rabin received the Dr.Rainer Hildebrandt Human Rights Award endowed by Alexandra Hildebrandt. The award is given annually in recognition of extraordinary, non-violent commitment to human rights. Many cities and towns in Israel have named streets, neighbourhoods, schools, bridges and parks after Rabin. The country's largest power station, Orot Rabin, two government office complexes (at the HaKirya in Tel Aviv and the Sail Tower in Haifa), the Israeli terminal of the Arava/Araba border crossing with Jordan, and two synagogues are also named after him. Outside Israel, there are streets and squares named after him in Bonn, Berlin, Chicago, Madrid, Miami, New York City, and Odessa and parks in Montreal, Paris, Rome and Lima. The community Jewish high school in Ottawa is also named after him. The Cambridge University Israel Society hosts its annual academic lecture in honour of Yitzhak Rabin. Ben Artzi-Pelossof, Noa (1997). In the Name of Sorrow and Hope. ISBN 978-0-517-17963-5. Benedikt, Linda. Yitzhak Rabin: The Battle for Peace. ISBN 1-904950-06-X. Cleveland, William I. (1994). A History of the Modern Middle East. Westview Press. Ephron, Dan (2015). Killing a King: The Assassination of Yitzhak Rabin and the Remaking of Israel. W. W. Norton & Company. ISBN 978-0393242096. Gresh, Alain; Vidal, Dominique (2004). The New A to Z of the Middle East. I B Tauris. Inbar, Efraim (1999). Rabin and Israel National Security. Woodrow Wilson Press. Kurzman, Dan (1998). Soldier of Peace: The Life of Yitzhak Rabin 1922-1995. Harper Collins. ISBN 0-06-018684-4. Milstein, Uri (1999). The Rabin File. Gefen. ISBN 965-229-196-X. Pappe, Ilan (2004). A History of Modern Palestine. Cambridge University Press. Quigley, John (2004). The Case for Palestine: The International Law Perspective. Duke University Press. Rabin, Leah. Rabin: Our Life, His Legacy. ISBN 0-399-14217-7. Rabin, Yitzhak. The Rabin Memoirs. ISBN 0-520-20766-1. Shlaim, Avi (2000). The Iron Wall: Israel and the Arab World. Penguin Books. Slater, Robert (2015). Rabin: 20 Years After. Kotarim International Publishing. ISBN 978-9-657-58913-7. Slater, Robert (1993). Rabin of Israel. Robson Books. Smith, Charles D. (2004). Palestine and the Arab-Israeli Conflict (5th ed.). Macmillan Press. Sorek, Tamir (2015). Palestinian Commemoration in Israel: Calendars, Monuments, and Martyrs. Stanford, CA: Stanford University Press. pp. 217–232. ISBN 9780804795180. Tessler, Mark (1974). A History of the Israeli-Palestinian Conflict. Indiana University Press. ^ "Rabin". Collins English Dictionary. ^ izrus.co.il (18 March 2010). "До��азано украинское происхождение Ицхака Рабина | Еврейские новости мира и Украины | ВЕК – Всеукраинский еврейский конгресс". Jewish.kiev.ua. Retrieved 31 August 2011. ^ Slater, Robert (1993). Rabin of Israel: Biography of the Embattled Prime Minister. New York: St. Martin's Press. p. 25. ISBN 0312093683. ^ Kurzman, Dan (1998). Soldier of Peace: The Life of Yitzhak Rabin, 1922–1995 (1. ed.). New York, NY: HarperCollins. p. 75. ISBN 0060186844. ^ Morris, Benny (1987). The Birth of the Palestinian Refugee Problem 1947–1949. Cambridge Middle East Library. Cambridge, United Kingdom: Cambridge University Press. p. 207. ^ Peri, Yoram. "Between battles and ballots. Israeli military in politics." Cambridge University Press. 1983. ISBN 0-521-24414-5. p. 62. ^ Yitzhak Rabin Center (n.d.). "Biography of Yitzhak Rabin" (PDF). p. 3. ^ Maoz, Zeev (2006). Defending the Holy Land. University of Michigan Press. pp. 100–101. ISBN 0472115405. ^ Krauthammer, Charles (18 May 2007). "Prelude to the Six Days". The Washington Post. ^ Parks, Michael (29 July 1994). "Rivalry Between Rabin, Peres Rekindled Over Who Deserves Credit for Jordan Pact". Los Angeles Times. Retrieved 21 July 2014. ^ "Interim Agreement between Israel and Egypt". Knesset.gov.il. Retrieved 31 August 2011. ^ Avner, Yehuda (2010). The Prime Ministers: An Intimate Narrative of Israeli Leadership. The Toby Press. pp. 303–18. ISBN 978-1-59264-278-6. ^ Avner, Yehuda (2010). The Prime Ministers: An Intimate Narrative of Israeli Leadership. The Toby Press. ISBN 978-1-59264-278-6. ^ "Rabin Resigns Following Probe into Illegal Bank Accounts Held by Him and His Wife in Washington". JTA. 8 April 1977. Retrieved 9 June 2013. ^ Shipler, David K. (26 January 1988). "U.S. Jews Torn Over Arab Beatings". The New York Times. ^ "Israel Declines to Study Rabin Tie to Beatings". The New York Times. 12 July 1990. ^ a b Shlaim, Avi (2000). The Iron Wall; Israel and the Arab World. Penguin Books. pp. 453–57. ISBN 0-14-028870-8. ^ Sicherman, Harvey. "Yitzhak Rabin: An Appreciation". Foreign Policy Research Institute. Archived from the original on 9 September 2008. ^ Gelvin, James L (2007). "Chapter 10: Coming full circle – Oslo and its aftermath". The Israel-Palestine conflict: One Hundred Years of War. Cambridge & New York: Cambridge University Press. p. 233. ISBN 978-0521716529. Retrieved 16 September 2012. ^ Leora Eren Frucht (3 November 2000). "Her Grandfather, His Legacy". Jerusalem Post. Archived from the original on 24 March 2006. Retrieved 3 April 2012. ^ Katz, Shmuel (20 October 1995). "Yitzhak Rabin's Own Chutzpah..." (PDF). Jewish Daily Forward. ^ Schmemann, Serge (22 August 1995). "Bus bombing kills five in Jerusalem; 100 are wounded". New York Times. ^ "20 years on, Rabin's right-hand man regrets arguments won, and lost". The Times of Israel. Retrieved 28 November 2016. ^ Dicus, Howard (1993). "1993 Year in Review: Israeli-Palestinian Peace Treaty". United Press International. Retrieved 16 September 2012. ^ Dicus, Howard (1994). "1994 Year in Review: Treaty between Israel and Jordan and Peace in Ireland". United Press International. Retrieved 16 September 2012. ^ Asa-El, Amotz. "Yitzhak Rabin's little-known economic legacy". ^ "Be Careful What You Privatize". 30 August 2015 – via Haaretz. ^ "The Bottom Line / When the Horses Are Far, Far Away". 26 September 2001 – via Haaretz. ^ "Silicon Israel". 23 December 2015. ^ "Yitzhak Rabin - Biographical". Nobelprize.org. Retrieved 31 August 2011. ^ Karsh, Efraim (2006). Islamic Imperialism: A History. Yale University Press. p. 181. ISBN 0300106033. ^ "Shalom haver". Archived from the original on 23 June 2009. ^ Moshe Reinfeld (1 April 2003). "Avishai Raviv acquitted of having failed to prevent Rabin assassination". Haaretz. Retrieved 8 September 2013. ^ "Deputy Defense Minister Dalia Rabin-Pelossof". IMRA. 12 June 2001. Retrieved 8 September 2013. ^ "חוקים לזכרו של יצחק רבין" (in Hebrew). ^ "גרסה להדפסה: מדינה שלמה על שם רבין – וואלה! חדשות". walla.co.il. Retrieved 31 August 2011. ^ "Yitzhak Rabin High School". ^ "Abierta la glorieta de Isaac Rabin". abc.es. Retrieved 11 May 2014. ^ "CU Israel Society Statement – Inaugural Yitzhak Rabin Memorial Lecture". Union of Jewish Students. 14 November 2010. Retrieved 31 August 2011. Rabinovich, Itamar (2017). Yitzhak Rabin: Soldier, Leader, Statesman. New Haven, Conn.: Yale University Press. ISBN 978-0-30-021229-7. Wikimedia Commons has media related to Yitzhak Rabin. One of the last recorded interviews with Yitzhak Rabin – a six-minute interview with David Esing, recorded one month before his assassination. Dromi, Uri (5 November 2005). "Still craving peace 10 years after Rabin". New Straits Times, p. 20. "Israel marks Rabin assassination". (5 November 2005). BBC.